Experienced strength athletes can increase their maximal weight for bench presses by ten percent in just a couple of weeks by raising the bar faster than normal – and lowering it more slowly than normal. Researchers at the University of Rome write about this in the International Journal of Sports Medicine. 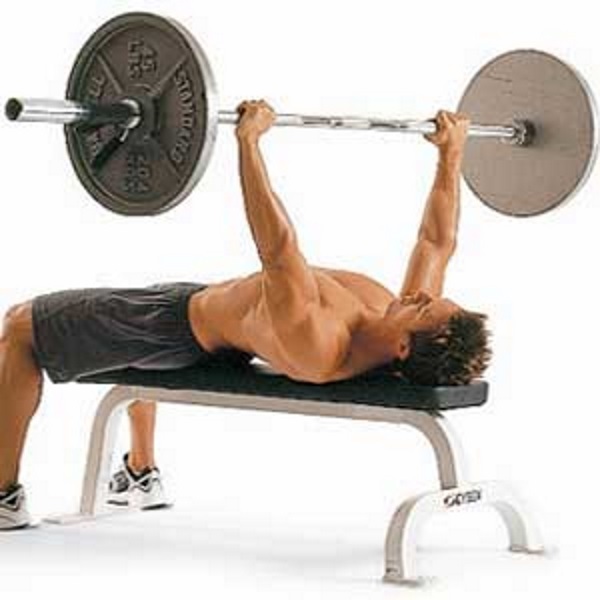 The researchers believe that lifting weights at higher speed gives muscle growth extra impetus. They also suspect that strength athletes tend to train at the speed they find easiest – which is probably not the speed that will produce the best results. The researchers performed experiments with 20 subjects in their forties, all of whom had been doing weight training for 18-19 years. The researchers divided their subjects into 2 groups. The subjects in one group continued to train as they were used to doing, moving the weights at their own preferred speed for the bench press [SPS]. This was the control group. The experimental group did bench presses at a fixed speed. The subjects pushed the weights up at 80-100 percent of their maximal speed [FPS]. The figure below shows that the upward, concentric movement took the experimental group 0.8 seconds to perform. This movement took the control group 1.3 seconds. The downward, eccentric, movement took 2 seconds in the experimental group and 1.5 seconds in the control group. Both groups trained twice a week using weights that were 55 percent of the weight at which they could just manage 1 rep [1RM]. Between sets they rested for two minutes. For the experimental group bench press training ended when the athletes could only lift at 80 percent of their maximal speed; the control group continued training until the point of exhaustion. After three weeks the researchers observed that the maximal strength of the control group subjects had remained constant, but that of the subjects in the experimental group had increased by 10.2 percent. The maximal speed had also increased by more in the experimental group than in the control group. The researchers suspect that speeding up the concentric movement resulted in the muscle tissue receiving stronger electrical impulses from the nervous system. And as a result, more muscle fibres contracted, and therefore developed, than otherwise would be the case. Int J Sports Med. 2012 May;33(5):376-80.